Virgin Australia alliance partner and HNA Group carrier Hainan Airlines has added Brisbane to its growing Oceania route network with the start of nonstop flights between Shenzhen and Brisbane. Flight HU411, operated by Airbus A330-200 B-5963 landed at Brisbane at about 0930 on Thursday, following its near nine-hour journey from Shenzhen. The aircraft was on the ground for about two hours before taking off as the reciprocal HU412 bound for Shenzhen, located in Guangdong Province on China’s south coast and a short boat or train ride from the special administrative region of Hong Kong. Shenzhen also has a “sister city” relationship with Brisbane. Hainan is the only airline offering nonstop flights between the two cities. Representatives from the Queensland government and Brisbane Airport were on hand to greet passengers from the inaugural flight. 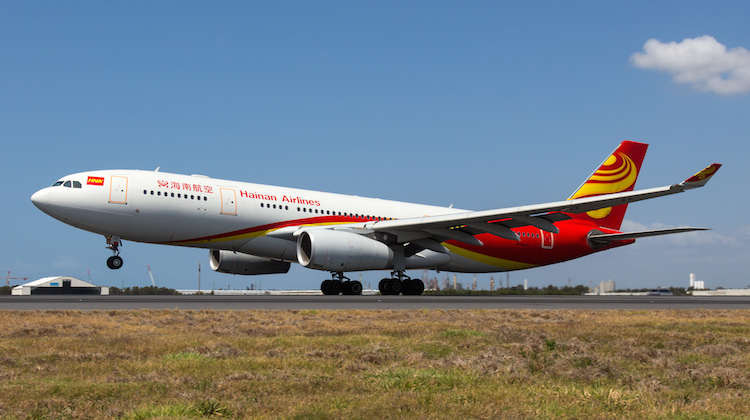 Hainan’s Brisbane service will run on Mondays and Thursdays. It is also due to launch Shenzhen-Cairns flights in December. Currently, it serves Melbourne and Sydney from Changhsha and Xian, as well as Auckland from Shenzhen and Xian. In July, the Australian Competition and Consumer Commission (ACCC) approved an alliance between Virgin Australia and HNA Group carriers for a five-year term. As part of the alliance, Virgin Australia and Hong Kong Airlines, Hainan Airlines, Beijing Capital Airlines and Tianjin Airlines would codeshare on each other’s services between Australia and mainland China and Hong Kong, including flights via New Zealand and on routes within HNA Group airlines’ domestic networks. The first phase of the alliance was switched on in July, with Hong Kong Airlines codesharing on Virgin Australia’s nonstop flights between Melbourne and Hong Kong. The Australian flag carrier also added its VA airline code on Hong Kong Airlines’ five return services per week between Hong Kong and the Gold Coast and Cairns. Further, Virgin’s eight million plus Velocity frequent flyer members are able to earn points and status credits on all Hong Kong Airlines operated services except those to and from North America, as well as all Hainan Airlines, Beijing Capital Airlines and Tianjin Airlines operated flights between Australia, New Zealand and Greater China, and all domestic flights within those regions. HNA is a major shareholder in Virgin Australia and holds a seat on the board. Welcome to Brisbane Hainan Airlines.